Good news, everyone! The U.S. has shot up rapidly in its adoption of high-speed broadband, up to 20 percent in some states, according to Akamai’s latest State of the Internet report for the third quarter of 2013. Things seem to be on the up-and-up for American broadband connections, especially after data from Akamai’s Q2 report indicated that the country might be loosening its grip at the top tier of speeds. The biggest difference can be seen in the country’s overall average connection speed, which increased to 9.8 Mbps. The boost means that 49 out of 50 states have increased their average connection speeds since Q3 2012 — Vermont is the only exception, down almost 10 percent from 2012. Akamai attributed the increase to an uptake of high broadband (speeds over 10 Mbps) across the country, up more than 20 percent in some states. 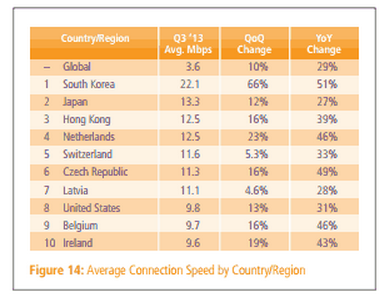 While the U.S. remains unable to crack the top 10 nations for peak speeds, the 40 percent increase in high broadband adoption means it ranks eighth in the world for broadband activity above 10 Mbps. But we (and everyone else), could stand to encourage a little more hustle in the slow transition from IPv4 to IPv6. In the third quarter, Akamai saw more than 760 million IPv4 addresses, growing by 8 million quarter-over-quarter and representing as much as one billion users. But along with that growth came the inevitable shrinkage of available IPv4 addresses, edging closer and closer to the deadline when transitioning to IPv6 is imperative. IPv6 adoption remains slow, although U.S. internet providers Google Fiber and Verizon Wireless accounted for the lion’s share of IPv6 traffic: 51 percent and 39 percent, respectively. The larger issue for IPv6 adoption remains at the slow rate enterprises are adopting the new protocol: Akamai noted a steady increase of IPv6 traffic from enterprise outfits throughout the year (surmised from increased weekday traffic and decreased weekend traffic), but consumer ISPs are lagging — Time Warner Cable’s IPv6 traffic was less than two percent. With these numbers, there’s an ever-increasing risk of fragmentation — forcing engineers to rapidly support a new protocol while remaining focused on the old one’s traffic. 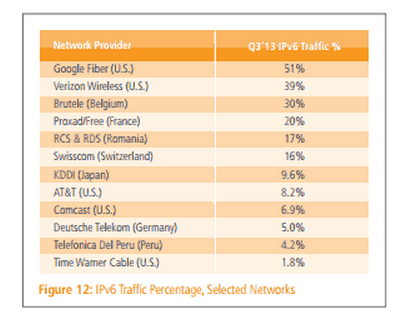 IPv6 is nowhere near the billion users who remain on IPv4, and the rollout continues to be slow and steady. The State of the Internet report is Akamai’s quarterly analysis of internet connection and behaviors through data gathered by the company’s globally distributed server system, the Intelligent Platform. The report covers desktop and mobile internet connections in up to 175 countries all over the world. The average used by high broadband and by average connection speed is about a quarter to a third of the actual link speed. Akamai measures this at the TCP level, and you typically have three or four TCP connections running in parallel when you’re web surfing. In practical terms, anybody with an average TCP speed above 10 Mbps is subscribing to a 30 Mbps or higher plan. Vermont’s an anomaly. They jumped way up in the rankings in 2012 as one of the community networks bumped its speeds, but apparently the rate wasn’t sustainable. Those percentages are the proportion of a given providers internet traffic that is IPv6, not the proportion of worldwide IPv6 traffic coming from that provider.